Also Recommended: Grimgar, KonoSuba: God's Blessing on This Wonderful World! Notes: Based on the light novel series written by Tappei Nagatsuki and illustrated by Shinchirou Otsuka, published by Media Factory’s MF Bunko J imprint. 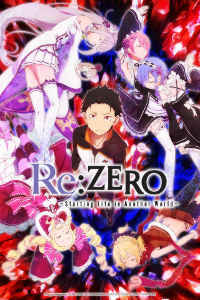 Tim: Re:ZERO -Starting Life in Another World- (or Re:ZERO for the rest of this review) is one of those anime in the “so close and yet so far” category. It could have been remembered as a modern classic, remembered years and even decades from now as a strong, rich anime, but it can't. It just can’t. But it’s also not a bad show, either. Heck, at times it’s rather good. But it falls into that irritating realm of “good, but not great”. A rather frustrating realm for any anime to be in. Stig: I was wary about this show even before I agreed to synchro it, partially because I already knew ahead of time what was going to go down in the infamous episodes 13 to 19, and for reasons I'll go into a bit later. The show seems to be almost universally liked, which eased up my decision to give it a chance, albeit not without reservations. And expect to be greatly annoyed by Subaru right out of the gate. He has a mouth bigger than his brain, jumps into situations without thinking through first, and eventually abuses his ability to respawn to a previous point when he dies as an actual plot device, killing any and all tension death could possibly bring to him in the series. His borderline obsession with Emilia doesn’t help either, which is the main reason why the middle episodes (12-18) are really a chore to sit through. Stig: Part of the reason why I had problems digesting the episodes personally is that the show, which had been pretty intriguing with a nice slow-burn as plots go, went into complete soapbox mode at that point. Once episode 13 rolls around, Subaru's ego explodes, then implodes, and in a rather spectacular fashion at that. And while this only lasts around an episode or so, the show then proceeds to grind him into the dust for several episodes straight with an almost sadistic glee, hitting him with tragedy after tragedy, and the problem I have with it is that I kind of get the impression said segment is meant to feed at my sense of vindication. 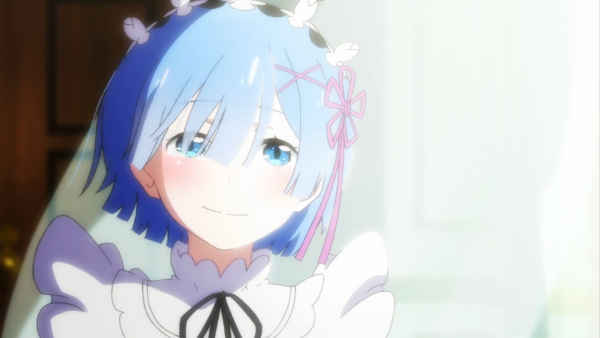 But even if it's not, it's still a seven-episode montage of someone slowly disintegrating mentally until the big moment that is episode 19, an episode that lasts nearly half an hour, and is half self-hating tirades and half Rem admittedly having her crowning moment of glory and endearing potentially every single viewer with this smile as a rerun from her flashback segment. Mind you (all), the other characters hardly start off warm and fuzzy, either. With the sole exception of Emilia, most of the female cast early on have this irritating habit of speaking in this sarcastic, condescending tone, mostly towards Subaru (since he's the main character and all), but also as a general thing. 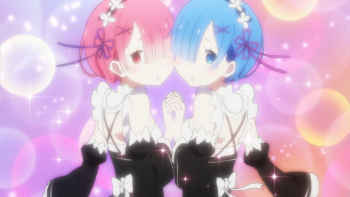 Chief among them are the twin maids Rem and Ram, who are so indistinguishable at first in their general rudeness, both of us had a really hard time imagining how they became two of the most beloved anime characters of 2016 in the Japanese anime community, Rem particularly so. Later on, when we meet a plethora of female candidates for the role of the Head Priestess/Queen of the Lands, well... yeah, let’s just say that whoever wins -- sans Emilia and perhaps Felt -- everyone loses. Oddly enough, Re:ZERO is a show where most male characters -- sans Subaru and potentially the old man at the council that oversees the Queen nominations -- are rather nice, good-natured folk. Felix in particular, a crossdressing cat-boy that had us fooled for a while, was handled with a lot of care and respect, and is one of the more positive characters in the show, being more direct rather than outright rude. A lot of the others were pretty pleasant as well, or were much nicer than initial impression made us think, which is always nice. It took us all the way until episode 9 - over a third into the series - before we got to what we considered the series’ first genuinely enjoyable episode. It’s about the childhoods of Rem and Ram, and it’s a heartbreaking tearjerker of a time. Suddenly their personalities and actions make sense, and Rem especially opens up as a character afterwards (or at least is more fleshed out, since she can get a bit...crazy at times). It’s around this time that we start to learn about Emilia’s past as well, and why she’s shunned by most of the world around her. The cast of Re:ZERO have lots of skeletons in their closet, and the series is going to show you every last one of them, for both good and bad. (If not necessarily in this season.) It's the episode that really drives the point home that the world they all live in, and that Subaru was transported to, is a very violent one, and there are far bigger and nastier dangers out there than some bandits with swords, much less a trio of thugs that are barely up to Subaru's level of athleticism. As you might have realized, the series isn’t just a character drama. There is quite a bit of action as well in Re:ZERO, and it can get rather violent, with enough blood on screen to make the squeamish shift uncomfortably in their chairs, including showcasing the corpses of dead children! And if you don’t like violence on animals - even if the animals are evil and demonic looking - this is not your show, either. They’re also really well-animated and detailed, allowing you to see all the ugliness of battle, whether you want to or not. This is especially apparent in the last third of the show, which is almost nothing but non-stop fighting, with small pauses for backstory for the characters. 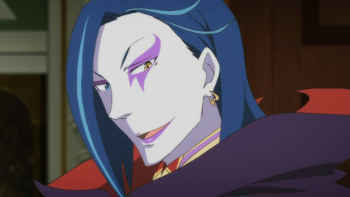 Said plot arc not only introduces us to a terrifying beast that proves that there are so many things worse than dying, but also one of the bigger villains in Re:ZERO so far; Betelgeuse Conti, who is the archbishop of sloth. He's the one who puts a face on the sheer, undiluted madness in this show, and while his very…animated behavior during conversations might amuse people, some of the other things he does will definitely not. Particularly since he shows up during the infamous meltdown arc and takes a special interest in Subaru, as well as being the head of a squad that spends most of its time assassinating people. And that’s one of the big problems with Re:ZERO; the series gives itself little time to relax and breathe, particularly near the end. Every other minute we have something dramatic happening, or a battle about to occur, or a flashback of a character to watch. 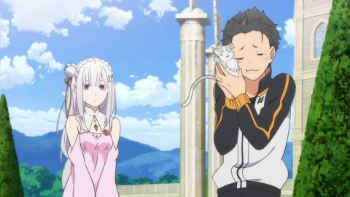 After episode 12, there’s very little in the way of slice-of-life or lighthearted moments, aside from a few sweet scenes with Rem and Subaru here and there (as much as he can be an irritant, he does a rather good job at coaxing smiles out of people, the girls in particular, and he's surprisingly popular with the kids ), with Rem more or less becomes Subaru's main supporter after a certain famous moment. The show is plot-dense enough that action scenes can go on for episodes on end, so any chances for the audience to relax for a while can and should be appreciated. Granted, this does lend itself to the general tone of the show; you don't get to relax until it has exhausted you to the point of collapsing. We guess that's just how it rolls. So far, you might be somewhat confused by the star rating we gave this show, after all the negativity we have given it. Which is understandable. But here’s the important thing; unlike the many other ugly, unpleasant shows we’ve watched together for the experience of it, Re:ZERO actually does a really good job at weaving an intriguing story. Each arc has a clear structure going from act to act, and there’s little in the way of filler overall. While the show does these comedic beats from time to time, there is no “comic relief” character among the bunch that’s there to just be an irritating eye/audiosore. Felix's crossdressing just is what it is, and he's otherwise presented as playful in general -- the series could have easily had him be the most adorable cat-boy comic relief in this regard -- but in battle he’s just as serious as anyone else is. He became one of our favorite characters of the entire show, especially in the series’ final episodes, where he had to make a rather tough decision. Re:ZERO, for the most part, is also a darn good looking show. Despite its rather large cast, the art always holds up, and the animation can get pretty impressive at times. 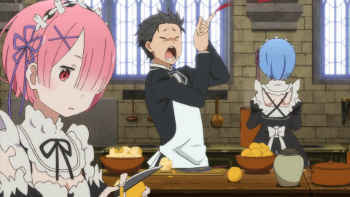 The characters, for the most part, also dress like normal people; even Rem and Ram’s maid outfits are quite tasteful for the seinen genre - slightly fanservice-ish, but not ridiculously so. Felix does, as mentioned earlier, dress like a girl - and yes, he did fool us for a while - but not as one would call it excessively girly. Dress style tends to follow social class more than gender anyway. But does the good art and occasionally cute scene save this show? Yes and no. The beginning arc is rather long and stretched, and Subaru takes a loooong time to warm up to. His special power doesn't help either, as upon death, he is placed back at the beginning of the timeline. It’s partially intentional, granted, since the whole thing is about Subaru trying to figure out this strange and somewhat gruesome ability. But if the show wanted us to feel like Subaru is slowly progressing, it certainly succeeded in that. The last third of the show is almost nothing but battle after battle, including one colossal, life-threatening battle that takes up nearly three whole episodes on its own. The smarmy dialogue could be toned down a bit, too, as it lends itself to the aforementioned soapbox aspect mentioned earlier much too often, considering that Re:ZERO can't lean on being amusingly dense about it like GATE was. But when Re:ZERO shines, it really does shine. The world is big and full of lots of mythos - perfect for future seasons to expand on. There’s also a good deal of exposition on future events that are done well enough to not feel like they’re cheating by not showing you the outcome of them until more of the show is made (if it ever will be. Which we hope does). Rem, once she opens up, is easily one of the most likable, sweetest girls in recent anime memory, and even some of the more hardball-playing characters gets to show their more benevolent sides, which was a welcome break from an otherwise incredibly cynical show. But the path to get there is a tough one, and not one everyone will enjoy. Stig: As I expected, Re:ZERO is a good show, even beyond its soapboxing. The greatest part is its intriguing plot, certainly, and one that hasn't even been completed yet, so I am wanting for more. Where it falters a bit -- which isn't as much the anime's fault as its source material -- is the sour grapes that make up much of the middle section. It doesn't ruin the show, but it's a hurdle that needs to be passed either way, and not for the reason the creator probably intended. If I'm allowed to watch more of it in the future, I hope it's not something I'll have to experience again. Tim: Re:ZERO is a show both easy to love and to hate at the very same time. Some of the characters are absolutely wonderful, and the production values are, for a series as long as it is, amazing. But I’d be lying if I said it didn’t have its share of slow, annoying, and frustrating moments, like the arc that starts halfway through the season. 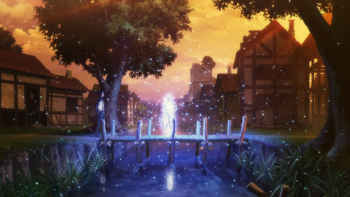 Despite that, it’s one of the better fantasy anime I’ve seen in recent anime memory. 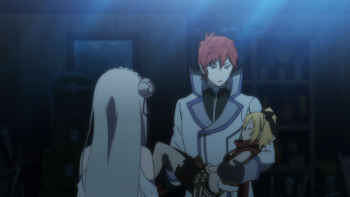 If more “trapped in another world” anime had the depth, focus, and solid writing of Re:ZERO, I wouldn’t keep groaning every anime season when one or two anime of this genre popped up. 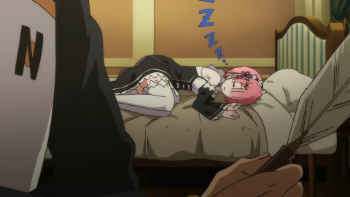 Recommended Audience: Re:ZERO is a very violent show, and it's not afraid to show the blood and even the corpses of said victims, never mind a certain scene in the meltdown arc where Betelgeuse does something to Rem that we'd rather not repeat here. There’s also some mild fan service, but it’s so little it's basically irrelevant. The blood and violence is much more prevalent, pushing this series to older teens at the lowest.